David W. Lipcon of Lipcon & Lipcon, P.A. “Mercy Adel” (whose name has been changed to protect her identity) was sharing a one bedroom suite with her sister at a luxurious hotel in Weston, Florida. She was visiting in town, from New York, with her sister, for a family wedding. The entry to her suite had a foyer with a marble tiled floor that extended to the adjacent kitchen area. Beyond the foyer and the kitchen area was a carpeted living room. On her second morning, a little before 9 o’clock AM, the sisters woke up and were getting dressed for a family brunch at the hotel. Ms. Adel’s sister commented that the suite was uncomfortably warm and humid. This prompted Ms. Adel to walk towards the thermostat to see if the A/C was working correctly. As she was walking from the bedroom to the living room on the way to the foyer where the thermostat was located on the wall, she took a step onto the marble tile and slid “like she had stepped onto an ice rink.” The fall was fast and hard. Ms. Adel landed forcefully on her left knee. Unfortunately, the impact to her knee caused serious injury. Ms. Adel never expected to be stepping onto a wet/slippery floor. It was clear that the A/C unit was not working correctly and left the hotel room humid, which caused water to condense on the marble tile. Injury: She sustained a severe comminuted displaced fracture of her left patella, requiring surgery. After the accident, the hotel made a brief apology and blamed Ms. Adel for “not being careful” while she was walking. Ms. Adel knew at this point, she needed an attorney. She hired David W. Lipcon of Lipcon & Lipcon, P.A. 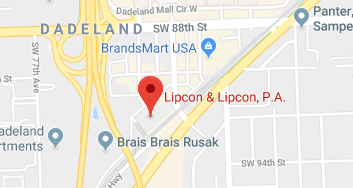 Lipcon & Lipcon is a boutique personal injury law firm that has been litigating injury cases in South Florida for decades. After filing a lawsuit, and beginning the investigation stage of litigation, Mr. Lipcon negotiated a settlement with the hotel for $320,000.00. When asked about the case, Lipcon stated that at first the claim was met with much resistance. However, after working with the adjuster, a fair settlement was achieved for both parties.